Sit up as straight as possible when you eat. 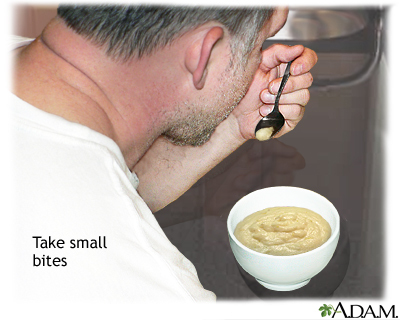 Take small bites, less than 1 teaspoon (5 grams) of food per bite. Chew well and swallow your food before taking another bite. If one side of your face or mouth is weaker, chew food on the stronger side of your mouth. DO NOT mix solid foods with liquids in the same bite. DO NOT try to wash down solids with sips of liquids, unless your therapist told you to eat this way. Sit upright for 30 to 45 minutes after eating. You may need someone to remind you to finish swallowing. DO NOT drink thin liquids without checking with your doctor or therapist first. Ask caregivers and family members not to talk to you when you are eating or drinking.